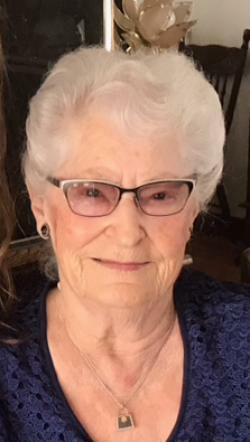 Huberte Maillet, 87, of Sainte-Marie-de-Kent, passed away peacefully, surrounded by her family, at the Dr. Georges-L Dumont UHC, Moncton on Wednesday January 30, 2019. She was married to Ovila C. Maillet. Born in Sainte-Marie-de-Kent, she was the daughter of the late Emilien and the late Alice (Henri) LeBlanc. Huberte was co-founder of O.C. Maillet Transport. She will be dearly missed by her husband of 70 years, Ovila, her eight children; Jeannette LeBlanc (Donald) of Dieppe, Paul (May) of Bouctouche, Linda Maillet (Joe) of Middle Sackville, NS, Charline Delong of Fredericton, Noëlla Maillet of Dieppe, Charles (Jacqueline) of Sainte-Marie-de-Kent, Shirley Collette (Roland) of Dieppe and Alice Green (James) of Moncton, her eleven grandchildren; Michel, Serge, Marc, Yves, Julien, Julie, Maurice, Mario, Denis, Luc and Amy as well as twelve great grandchildren. She also leaves to mourn her five sisters; Cécile Lessard (late Marcel), Lina Mannucci (Pascal) of Montreal, Bernice Goguen (Normand) of Florida, Diana Atkinson (Gordie) of Dieppe, Geralda Stockmon (John) of Moncton, one brother Robert (Lise) of Montreal as well as several nephews and nieces. She was predeceased by one son Aldéo (October 2018), one sister Albertine and one brother Clarence. Visitations will be held at the Notre-Dame du Mont Carmel Roman Catholic Church Slumber Room, Sainte-Marie-de-Kent on Sunday February 3, 2019 from 7 to 9 and on Monday from 2 to 4 and 5:30 to 6:45 pm. Funeral Mass will be celebrated on Monday February 4, at the Sainte-Marie-de-Kent Church at 7:00 pm with interment in the parish cemetery in the spring. In Huberte’s memory, donations may be made to the Sainte-Marie-de-Kent parish Cemetery fund.